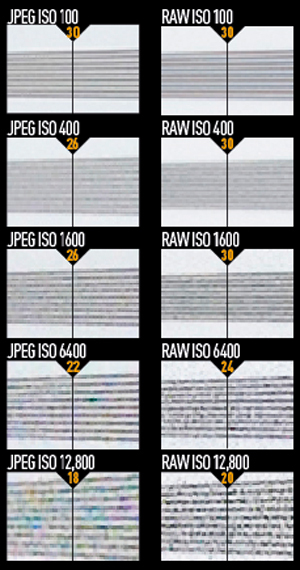 These images show 72ppi (100% on a computer screen) sections of images of a resolution chart, captured using the Nikon 18-55mm f/3.5-5.6 VR set to 50mm f/8. We show the section of the resolution chart where the camera starts to fail to reproduce the lines separately. The higher the number visible in these images, the better the camera’s detail resolution is at the specified sensitivity setting. A camera with 24.2 million pixels on an APS-C-sized sensor is bound to impress us with its ability to resolve detail, and the D3200 does not disappoint. Using the 18-55mm VC kit lens, at ISO 100 the camera reaches the 30 marker on our resolution charts, which is equivalent to class-leading APS-C-format cameras such as the Sony Alpha 77 and even full-frame models like the Canon EOS 5D Mark III. For an entry-level camera, this is exciting. With a more expensive lens, such as the Nikkor 50mm f/1.4 G, the D3200 resolves up to the 32 marker on the charts at ISO 100. As the camera uses the company’s latest Expeed 3 processor, we would also have high hopes for its ability to handle noise effectively. The first thing to note is that the native sensitivity runs from ISO 100-6400, like that of the Nikon D800, which uses the same processor, and the range can be extended up to ISO 12,800. 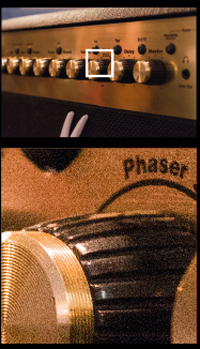 For ‘nominal’ exposures (those suggested by the camera’s metering), noise is well controlled all the way up to ISO 1600. In fact, I have taken some scenes inside a music shop at ISO 3200 that look clean. In these images, luminance noise is visible when viewed at 100%, but much less distinguishable at 50%, which is around the same file size as the D3100 at 100%. This is where the D3200 has a distinct advantage. Not only can files be cropped while maintaining a good level of detail, but if you reduce the print size from a full-resolution file to match a full-sized print of a camera such as the D3100, noise is less obvious. In short, higher resolution affords greater flexibility for cropping and high-quality printing. It is a pleasant surprise, then, that despite the increased number of pixels, performance in low light is still good. Only the extended ISO 12,800 setting should be completely avoided, as it demonstrates a severe drop in image quality with obvious luminance and chroma noise littering the frame. All in all, though, the level of detail that can be resolved and the ability to control noise by resizing images is where the D3200 shines.